In 1980, Yamaha's 25th anniversary, the company was searching for products that would constitute the seeds of new businesses. Around that same time, the Agriculture, Forestry and Fishery Aviation Association, an external body of the Ministry of Agriculture, Forestry and Fisheries, had been developing a system called the Remote Control Aerial Spraying System (RCASS). In the course of these activities, Yamaha had been asked to supply the engines, and this prompted Yamaha to enter the field of unmanned helicopters. After some time, in April 1983, the association entrusted Yamaha with overall development of the RCASS vehicle, including the engine. In response to the association's needs, the company initially did research and development on a helicopter powered by a snowmobile engine, but there were difficulties in overcoming problems with the complex mechanisms in the special counter-rotating rotor system, as well as a bevy of problems related to weight, cost, stability, and handling. Rumors spread among the engineers that the issues were insurmountable. 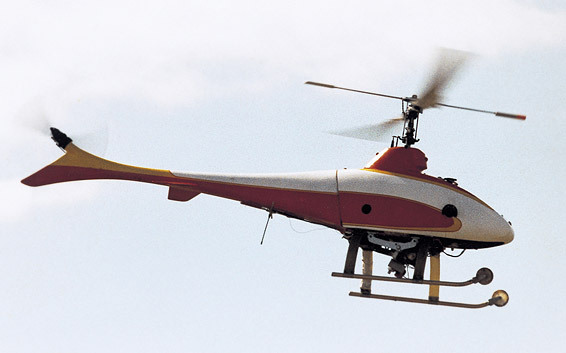 In 1985, on its own initiative, Yamaha started developing an unmanned helicopter with a single rotor plus tail rotor design, the same system found on conventional helicopters. Development led by Yamaha on the new single-rotor RCASS proceeded steadily and, in June 1986, the first prototype was completed. At the same time, the company's engineers were still quite a long way from resolving problems with the counter-rotating rotor version of the RCASS. Development was therefore shifted exclusively to the single-rotor model, which was officially dubbed the Yamaha R-50 Aero Robot. The first model, the R-50 (L09), was completed in 1987. At a demonstration flight sponsored by the Agriculture, Forestry and Fishery Aviation Association, the R-50 successfully accomplished its initial objective: crop dusting while carrying a 15-kilogram payload. Beginning in December that year, a limited run of just 20 of the aircraft was sold so that they could be closely monitored. Initially, the R-50 was developed so that it would be capable of spraying pesticides on rice paddies and orchards, and to protect places like golf courses from insects harmful to pine trees. The helicopter proved popular for this purpose, and was soon put to use spraying pesticides on crops of rice, barley, soybeans, lotus root, daikon radishes, chestnuts, and citrus fruits. Thanks to the commercialization of the R-50, the hard physical labor of spraying pesticides was eased, a positive step in the direction of attracting a new generation of farmers, which had become a problem in Japan. 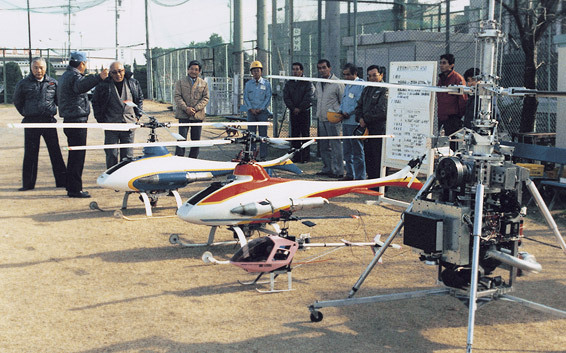 Instruction in techniques for using unmanned helicopters was authorized by the Ministry of Agriculture, Forestry and Fisheries in 1991, and, in 1992, the first National Industrial-Use Unmanned Helicopter Flight Technique Competition was held in Tochigi Prefecture. Since that time, the area sprayed with unmanned helicopters has increased every year, reaching 562,830 hectares as of 2003. Operators of the helicopters have also gradually increased. As of 2003, there were 9,574 operators nationwide licensed by the Ministry of Agriculture, Forestry and Fisheries.